People Skills are cognitive and soft skills that we need to live peacefully and work productively with other people. In the context of employment market, people skills are often referred to as employability skills. Along with good technical understanding and subject knowledge, employers often outline a set of skills that they want from an employee. These are called employability skills. The definition of employability skills most often used in higher education is the following: â€œA set of skills, knowledge and personal attributes that make an individual more likely to secure and be successful in their chosen occupation(s). Employers have identified 8 employability skills as important. 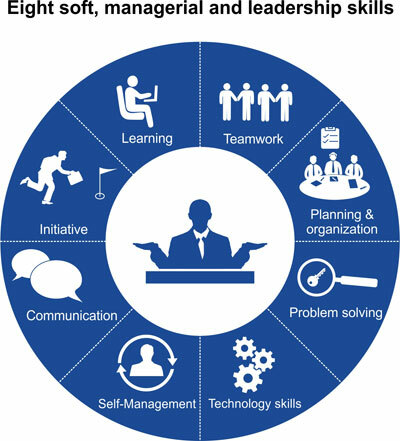 These transferable skills are: communication, teamwork, self management, learning skills, problem solving, technology, planning & organization, and initiative & enterprise. Services Sector: With the rise of services sector, employability skills are becoming more â€˜service orientedâ€™, making information and social skills increasingly important. To get employed in the services sector, (e.g. in business, finance and retail sectors) students need to have interpersonal skills â€“ staff who are able to explain things and solve problems in response to client needs. Manufacturing: Those who want to work in manufacturing will be working in teams and this style of working demands more internal communication and an ability to persuade, negotiate and influence. Creative: Creative workers are often working with more complex processes which demand greater thinking, reasoning and problem-solving skills. Regardless of industrial segments, employers like to recruit graduates who have gone the â€˜extra mileâ€™, 'joined in', can work both individually and in a team, shown a capacity for leadership, and demonstrated a willingness to take risks by spending time travelling, and experiencing new situations and cultures. The success of individuals in a knowledge-based economy will increasingly depend upon such employability skills. While basic literacy, numeracy, technical skills craft skills remain vital, todayâ€™s economy and society increasingly demands people with an ability to cope with change and adapt quickly to new environments and people. Simply put, more and more research suggests that getting a degree, and putting a few letters after your name is just not enough to land you that plum job, or to launch your career. What you need is a portfolio of employability skills. On the demand side, India will need 700 million skilled workers by 2022. But on the supply side, we do not have enough skilled people. Only about 15 million youngsters enter the workforce each year in India. And, more than 75 per cent are not job-ready. If you take graduates, the country produces about 10 million of them annually. Various studies have shown that a large percentage of them do not have employable skills. For instance, of the 2 million odd engineering graduates who pass out of colleges every year, less than 10% of them are employed readily. There is an urgent and growing need to make young Indians job-ready. In response to the glaring imbalance in supply and demand, Synergy offers 24-hour online Employability Skill Development Program (ESDP) focusing on young graduates to augment their employability. The course covers a varied number of skills required for an individual to become a professional. These Employability Skills includes soft skills that help an individual to efficiently communicate with peers maintaining harmony and work flexibility. The communication aspects of the course includes: Presentation and Influential Skills, Business Etiquette, Resume Writing, and Interview Skills.